When you work in retail, it’s inevitable that strange things will happen from time to time. Bookstores are probably less susceptible to such encounters than most other kinds of shops, but I’ve seen my share of weirdness. Quite often when I worked at a different, hyper-urban spot, not so much in recent years. However friendly and suburban it is, though, even Mercer Island is subject to the occasional odd visitation. A couple of months ago a guy came in asking about the Tao Te Ching, a text both religious and philosophical that dates back to the Chinese Zhuangzi period in the 4th century BCE, it’s not something I’ve ever read, but I know what it is and where we shelve it. I took him to the right section and pointed it out, whereupon he took issue with the version we had on offer. I could see his point. The one on the shelf at that moment bore the name of Stephen Mitchell, a poet and scholar who’s famous for his work on Gilgamesh, The Odyssey, the Bhagavad Gita, and other classical texts. He’s not really a translator, since he doesn’t know all the original languages in which these foundational works were written. His practice is to assemble various translations and reinterpret them for a general contemporary audience–they’re adaptations more than anything else. Really popular and really good as an introduction, but not the best choice for the more diligent student. So this customer told me at some length that Mitchell’s version was full of inaccuracies and recommended we carry a different one that was truer to the Chinese. He seemed fairly knowledgeable on the topic, and I made a mental note to investigate alternative options. Thus we parted. I should mention somewhere in here that this guy absolutely reeked of pot. No judgment–the fine voters of this state decreed many years ago that he was fully within his rights to walk around that way. Besides, who better to trust about Eastern philosophy than an unreconstructed hippie? This isn’t the weird part. Then he picked up the book and tore it into shreds. Asked, “Do you have a garbage can?” and walked out. He left behind a beat-up secondhand copy of the Tao Te Ching translated by Red Pine. 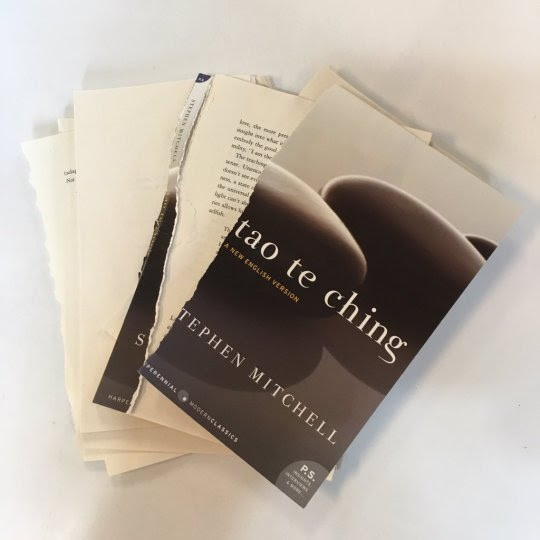 If anyone feels like reading the Tao Te Ching, I just ordered a hundred copies of Mitchell’s version. And one by Red Pine. James Crossley is a bookseller at Island Books on Mercer Island, WA and a frequent contributor to nwbooklovers.org. I love the world because this happened. Economically, better than “shrinkage.” Anecdotally, priceless. All and all, I’d say a win for team Island/James.